Want Advanced Find, Bulk edit, Merge records and Record sharing for Unified interface Apps as well ?? Just need to make one change. 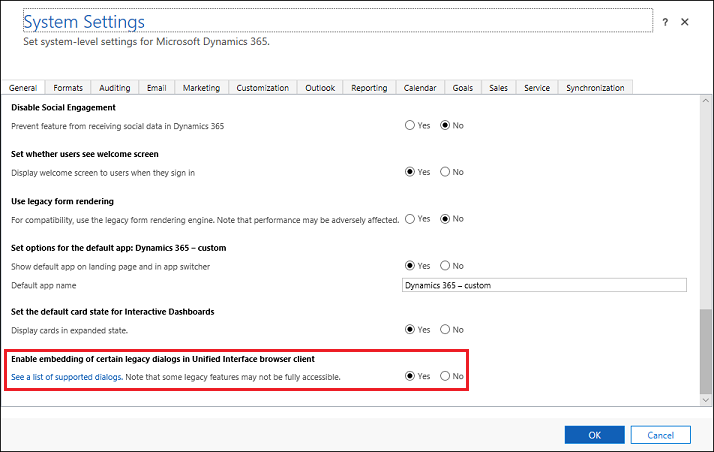 Set Enable embedding of certain legacy dialog’s in Unified Interface browser client to Yes. Dynamic CRM Technical crm Dynamics CRM Technical Feel Different About CRM, Know more Dynamic CRM Functional Section 1 Preparation for MB2-716 auditing Configure Microsoft Dynamics 365 settings technical C# Functional Dynamics CRM Functional Configure auditing, document management, and collaboration D365 entity Audting NewFeatureofV9.0; D365; Manage Microsoft Dynamics 365 security AuditNewValue QA AuditOldValue Implement themes Doubts Configure administration settings Manage teams dynamics portal Question & Answers Plugin Configure business units customization Blogs d365 portals D365 - Setting > Administration > Announcement.